In your opinion , is it necessary to use equlizing resistors parallell to diodes if you series connect the diodes to give a higher voltage rating? How much should one derate the diodes, is 50% sufficient? The reverse leakage current for diodes is not a carefully controlled parameter, and can vary substantially from unit to unit, even from the same manufacturing batch. When placed in series, the diodes with the lowest leakage current will have the highest voltage across them, which will cause them to fail, which in turn will apply excessive voltage to the remaining diodes, causing them to fail as well. The usual solution is to put a high-value resistor in parallel with each diode. Select the value of the resistor so that the current through the resistor (when the diodes are reverse-biased) is about 10× the worst-case leakage current of any diode. This means that the reverse voltage that appears across the diodes will not vary by more than about 10%. Note that this still means that you need some margin in the ratings of diodes. For example, for 600V of peak reverse voltage, you should use four 200-V diodes, not three. There is another phenomenon that comes into play as well. The diodes will not all "switch off" at the same speed when going from forward bias to reverse bias. Again, the "best" (fastest) diodes will fail first. The solution for this is to also place a capacitor, about 10 to 100 nF, in parallel with each diode. This limits the risetime (dV/dt) of the reverse voltage, allowing all of the diodes to switch before it rises too high. Recovery time isn't such a big deal for mains frequency applications, but it becomes critical beyond, say, a few kHz. And at higher frequencies, you can't afford much capacitance across the diodes, so it's all the more important to use monolithic (single high voltage die) or matched parts. Usually, a packaged HV diode is, internally, a stack of dies, matched by the manufacturer. I have rumaged through my boxes and did find a hefty tape of BYM26E , 1000V 2,3A avalanche rated fast diodes (trr 75ns) that I bouth sometimes.. Question is how does one match diodes, and to what parameter and is it doable? leakage current, under DC conditions demands some high voltage power supply but that is doable. Trr and other switching parameters would be more difficult. A 10nF cap across each diode would be about 50 times larger than the internal capacitance, and a leakage current of Vrr = 1000V of about 75uA equates a 13 Mohm balancing resistor. 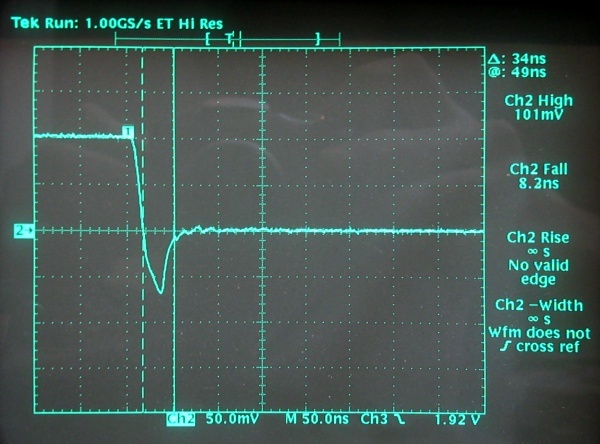 For use in a multiplier switching a say 40kHz that is totaly unfeasible. It's not the I_f and dI/dt of a proper test, but t_rr tends not to vary much with I_f so that's okay, and as long as I_f and dI/dt isn't varying between diodes, you can compare them just fine. Hard to see anything with at best 10ns resolution between samples.